The Anglo- Saxon Cross in St Peter’s. OS Grid Reference: SE 30657 33295. 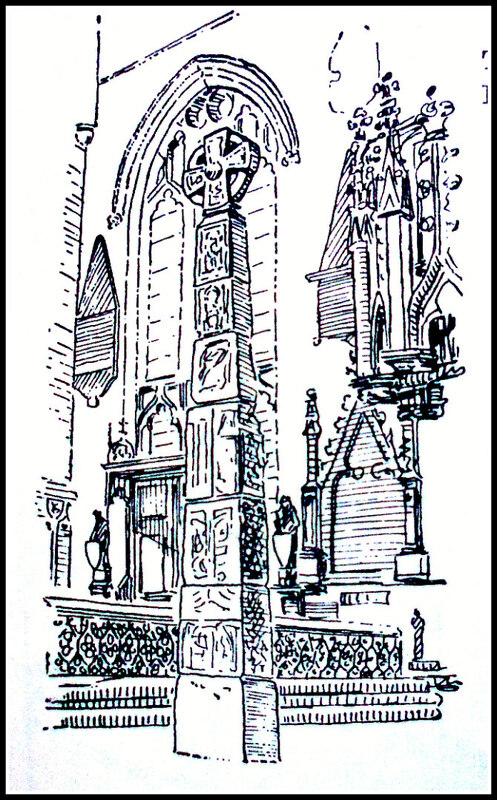 In St Peter’s parish church on Kirkgate in Leeds, west Yorkshire, there is a very tall and slender 10th century Anglo-Saxon wheel-headed cross, which stands on the Altar Flat. This very large city centre church is nowadays called Leeds Minster or ‘The Minster and Parish Church of Saint Peter-at-Leeds’. The cross-shaft fragments were discovered in the late 1830s when the tower was being demolished, but much of the present cross is a Victorian reconstruction of the original one, or as near to that as possible. 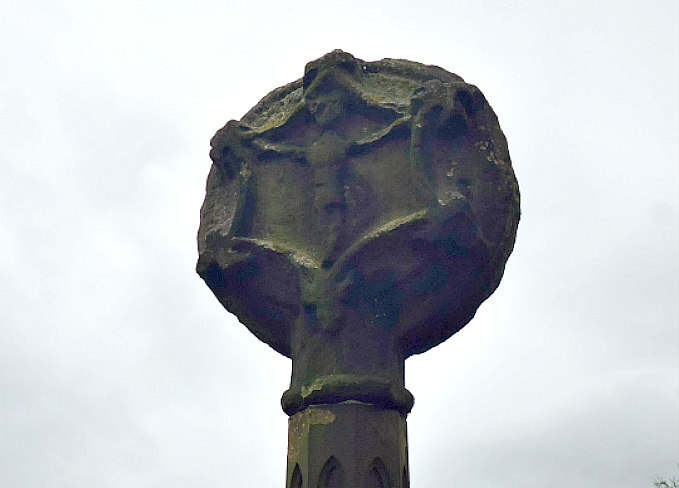 There are several carved (sculptured) panels on the tall cross-shaft whereas other sections have nothing at all; and though it looks to be somewhat “cobbled-together’, it is a fairly credible-looking piece of construction. The church “here” was first mentioned in the Domesday Book (1086) which stated that Leeds had a church, a priest and a mill; at this time the ruling overlord of Leeds was Ilbert de Lacy and the underlord, Ralph Paganel (Paynel). There may have been an earlier religious building on this site as far back as the early 7th century AD. 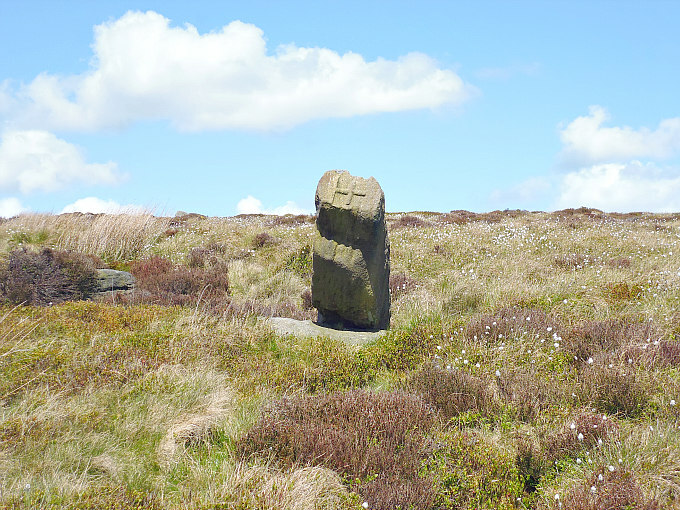 The restored cross shows Anglian and Scandinavian workmanship. It seems to be a platform for the Norse Legend of Weland the Smith, who features extensively on the monument. Weland or Weyland is depicted in a panel at the bottom of the cross in his flying machine with his tools of the trade. There are 10 carved sandstone panels but also some empty ones. Also, there is the usual interlacing, scrolls and end-knots, and a number of human figures both male and female as well as birds of prey. We see a cloaked figure holding a sword, a figure with a halo, a female figure held aloft by another figure, a female figure holding a horn, two hands grabbing hair; also Weland abducting the daughter of King Nidlad and Weland with a bird of prey. The wheel-head is considered not to be as old as the rest of the shaft and apparently comes from a different cross altogether. More information on this cross can be found on the Howard Williams (Archeodeath) website (see the link below). Bottomley, Frank, Yorkshire Churches, Alan Sutton Publishing Limited, Stroud, Gloucestershire, 1993. Categories: Ancient Churches / Chapels, Ancient Crosses | Tags: Saxon Cross in St Peter's Minster Church at Leeds in West Yorkshire | Permalink. St Peter’s Church (R. A. Riseley, 1952). OS Grid Reference: SJ 90082 76935. 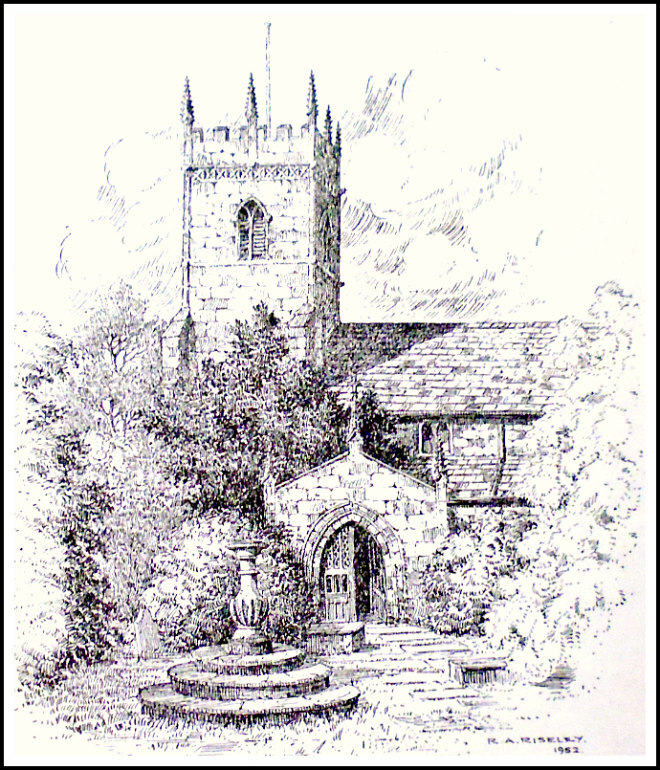 The 13th and 14th century grey sandstone parish church of St Peter at Prestbury, Cheshire, is located at the southwest side of the village, close by the A538 road (the village road), and just opposite The Bridge Hotel. The village is located some 4 miles to the southeast of Wilmslow. The River Bollin flows near the church. There was probably a late Saxon church on this site, or close by, in the 11th century. There is the obvious evidence with regard to that early church in the churchyard where there’s a very well-put-together monument made-up of two large fragments of Saxon crosses, which has some very nice, almost Celtic-like, carvings. Also in the churchyard a 12th century Norman chapel with a carved doorway that has some outstandingly beautiful sculptural work: above the doorway is a tympanum with “Christ in Majesty” and above that seven carved figures that are now sadly defaced. 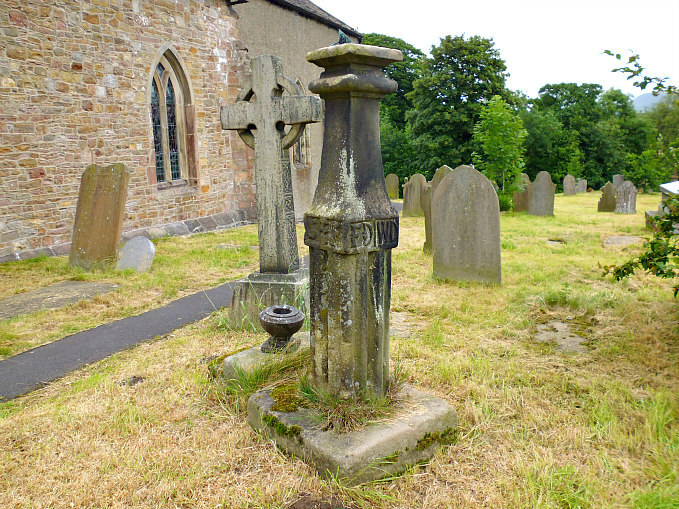 Saxon Cross in St Peter’s Churchyard by R. A. Riseley. 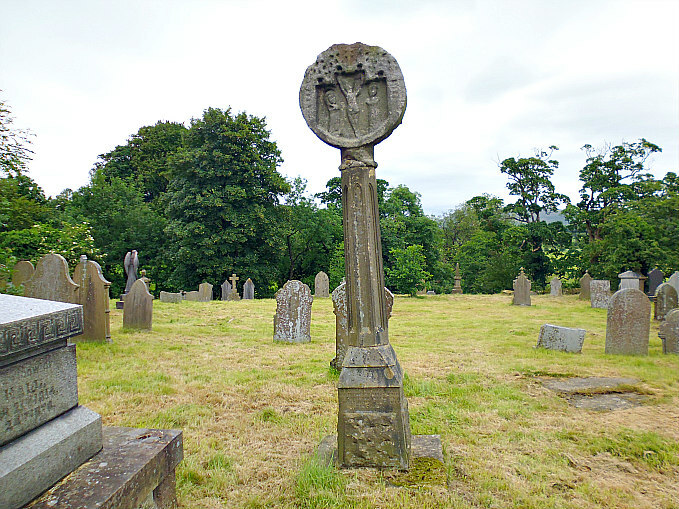 The Anglo-Saxon cross in the churchyard is actually two sections of different crosses that have been delicately placed together to form a T-shaped ancient monument; the carvings looking much more Celtic in design than Saxon. This may be due to the close proximity of Prestbury to the Welsh border and, we know that that border was as far east as Chester and Warrington back in the so-called Dark Ages, and so the Celtic influence was stronger. 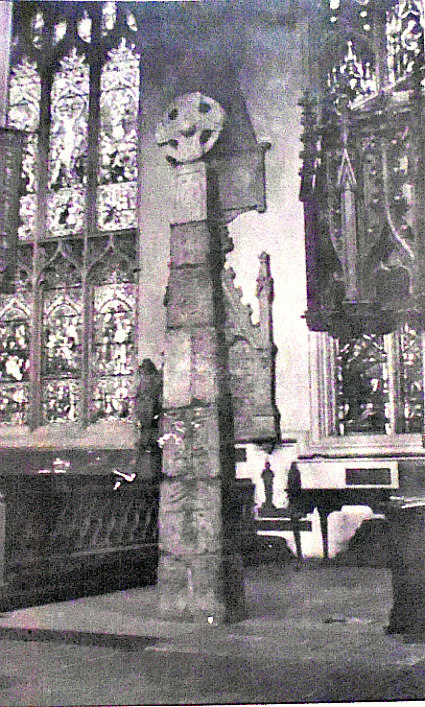 The cross fragments were discovered about 1841 when restoration work on the chancel was taking place; the sandstone fragments were embedded in the masonry. Originally the carved fragments were presumed to date from the 8th century, but today they are considered to be from the 10th or 11th century. It is richly carved all over with interlacing, interlinking and key-pattern designs. 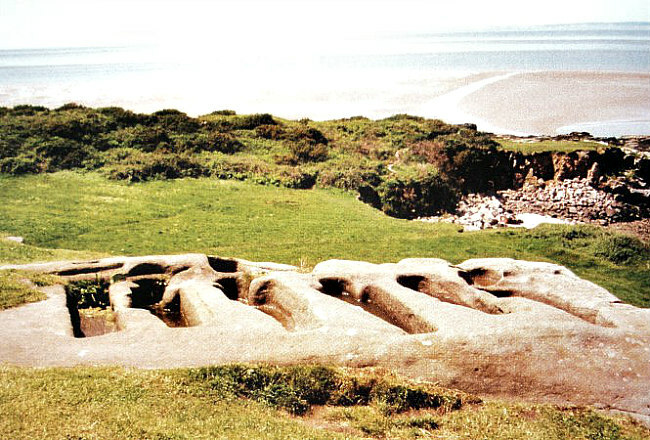 At the bottom there is a strange creature with a large, open mouth and several tails and a possible human figure, while there is a second human figure in the centre of the top T-shaped section. 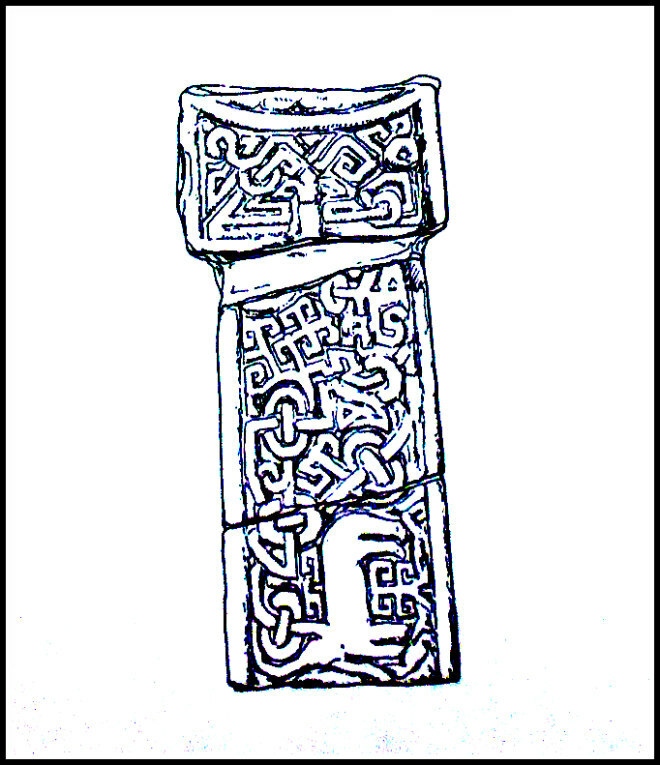 All-in-all a very beautiful piece of sculptured stonework, be it Celtic or Anglo-Saxon? Also in the churchyard a Grade II listed sundial dating from 1672. Norman Chapel at St Peter’s Church, Prestbury, by R. A. Riseley, 1955. At the southeast side of the parish church stands the 12th century Norman Chapel. 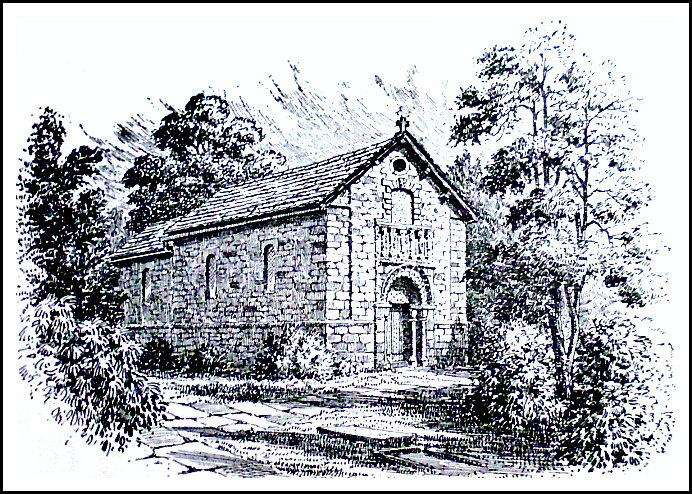 According to the booklet ‘Prestbury and its Ancient Church’ (1952): “The building which stands close to the present Church and which is generally known as the “Norman Chapel”, was probably built on the site of the more ancient Saxon edifice. It has a beautiful Norman doorway, a fine specimen of its kind. Over the doors is a tympanum representing “Christ in Majesty,” a subject which occurs in 21 other Norman tympana in England. Above on the corbel table are seven figures, now much defaced, which are of great interest, being unique in Christendom. Their interpretation seems to be as follows: The central figure represents God the Father holding the law in His left hand typified by an open book, and the Gospel in the right hand as fore-shadowed by the cross; conjointly justice and mercy are portrayed. The figure to the right with the animal (the Norman method of drawing a lamb) seems to stand for Christ, the Lamb of God , seated at the right hand of the Father. The figure to the left, having a resemblance to a bird, typifies the Holy Ghost in form of a dove. Collectively these three figures stand for the Trinity. St Peter with the key is shown in the sixth figure. To this saint the church was dedicated as is its successor at the present day. Figure two represents the monarch who reigned when the oratory was built, and this is almost certainly Richard I, Coeur de Lion, he being the first of the Norman kings to bear the budded scepter surmounted by a plain cross as here shown. The brings the date of the oratory within the year of his coronation, 1190, and that of his death, 1199. The Parish church of St Peter is a Grade I listed building and the Norman chapel is a Grade II listed building. Bottomley, Frank, The Church Explorer’s Guide, Kaye & Ward Ltd., London, 1978. Rogers, Harold, W (forward by the vicar), Prestbury and its Ancient Church, Macclesfield Press Ltd., 1958? (Drawings by R. A. Riseley). Categories: Ancient Churches & Chapels, Ancient Crosses | Tags: St Peter's Church at Prestbury in Cheshire | Permalink. 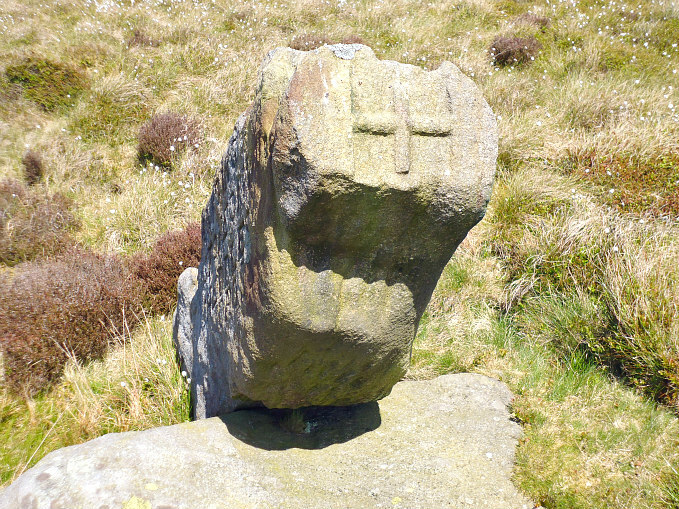 Affetside Medieval Cross, near Bury, in Greater Manchester. OS Grid Reference: SD 75471 13676. At the edge of Affetside village green, near Bury, Greater Manchester, stands an old cross of uncertain date. It is probably Medieval but, because it stands on the old Roman road (Watling Street), some historians have even considered it to be a Roman cross or milestone, or even a Roman column, but that seems unlikely. It is probably a pilgrims cross. Watling Street runs southeast from Affetside towards Manchester, and northwest in the opposite direction towards Ribchester. The village green has some modern standing stones and a large pond. 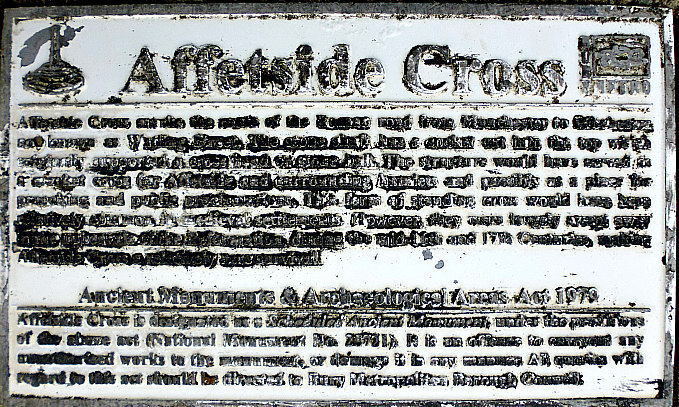 Affetside Cross is best reached from the A 676 (Ramsbottom road) and then southeast for ½ a mile along the almost straight-running lane that is the Roman road, bringing you into the picturesque little village, where you’ll find the old cross beside the green – you can’t really miss it! 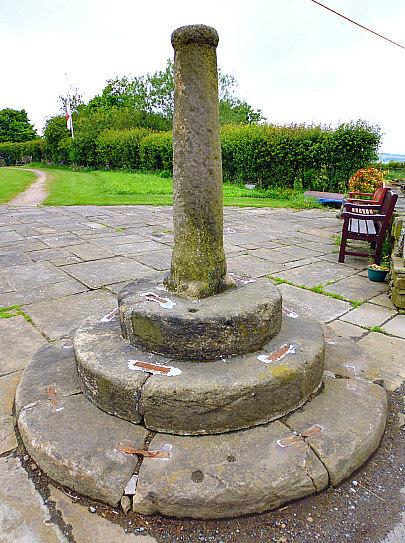 Affetside cross is about 4¼ feet high on its three steps, well actually two steps, as the top step is in effect the base which the gritstone shaft is socketed into, while the two lower circular, tiered steps are well worn with age. The shaft is formed from one complete length of local stone. 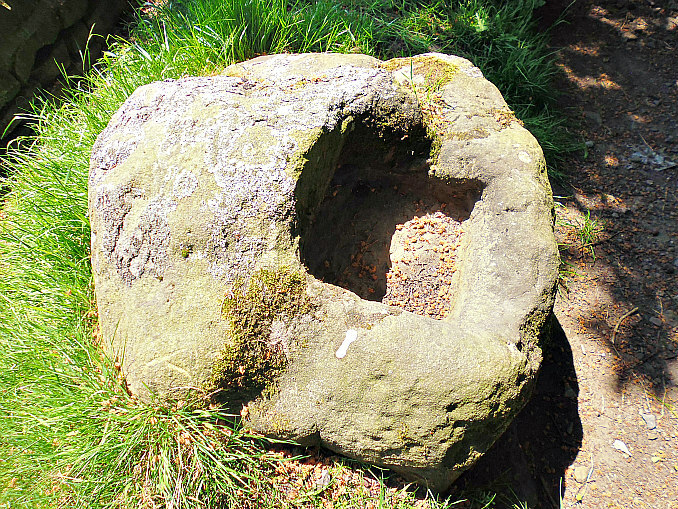 At the top of the shaft there is a collar with a round or bun-shaped capital which may originally have held a stone cross, or maybe it never did? This is perhaps why the cross-shaft has taken on the appearance of a Roman column! There looks to be some faint carving on the shaft, or is this simply the mason’s tool marks. Thought to be Medieval in date and probably a pilgrims cross that was used ‘as a place to stop and pray for a safe journey’ by those weary but very religious travelers – making their way to Whalley Abbey by way of Bury, Ramsbottom, Helmshore, Holcombe Moor and Accrington – from the late 13th/early 14th century until the Dissolution of that holy place in 1537, when pilgrimages ceased. 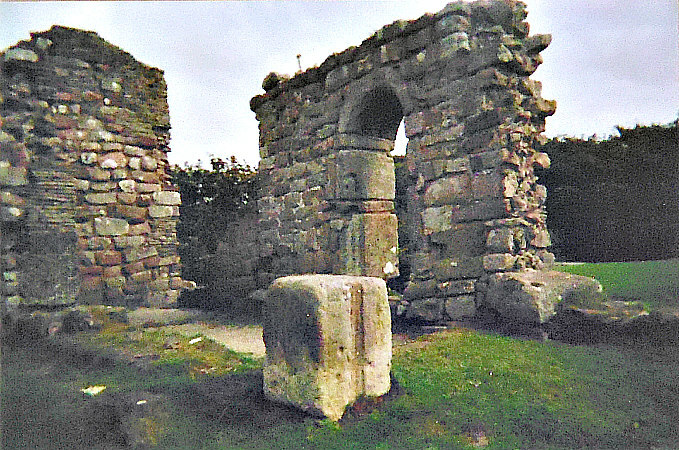 It would seem though the present monument is a market cross and more recent in age maybe 17th century, being re-erected about 1890, according to Pastscape. Information Plaque (now very hard to make out). The village of Affetside stands on the Roman road Watling Street which runs from here into Manchester (Mamucium) where there was a Roman fort and settlement, while in the opposite direction it runs to the fort at Ribchester (Bremetennacum). 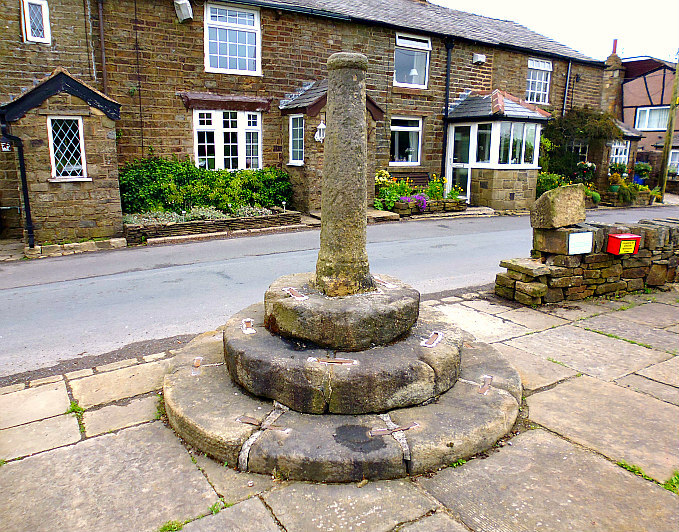 Is it possible that the pillar of the Affetside cross was a Roman milestone as the village is actually about halfway between the two forts; maybe it was re-fashioned by Medieval masons into what we see today. Or does the cross mark the site of a beacon – at which time an earlier monument or cross had stood here, apparently. These questions can never really be answered with certainty, we can only guess. Lofthouse, Jessica, Lancashire Countrygoer, Robert Hale Limited, London, 1964. Categories: Ancient Crosses, Roman Sites | Tags: Affetside Cross Near Bury in Greater Manchester | Permalink. Simon’s Cross near Simonstone, Lancashire. OS grid reference: SD 7760 3609. 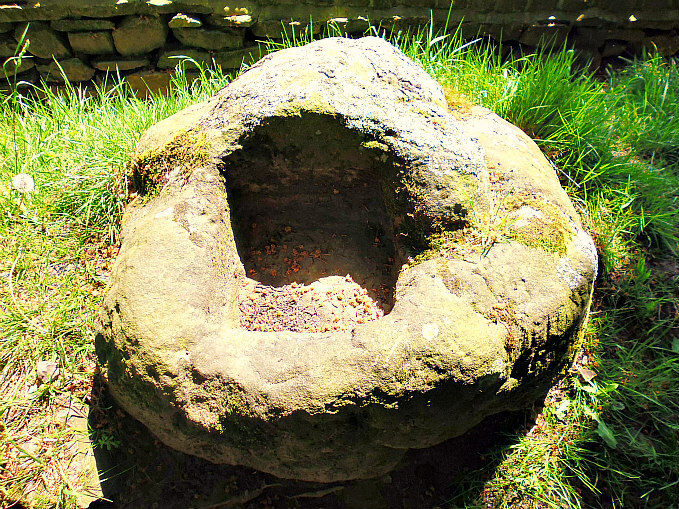 Upon White Hill and just beside Shady Walks at the north-side of Simonstone, near Padiham, Lanca-shire, is a large boulder with a deep socket hole. This is, in fact, the cross-base of a Medieval wayside cross which was known locally as ‘Simon’s Cross’, ‘Simon’s Stone’ or sometimes ‘Wart Well’. Very little is known about its history and who it was named for, or who actually erected the cross. There are inscriptions carved into the sides of the cross-base. 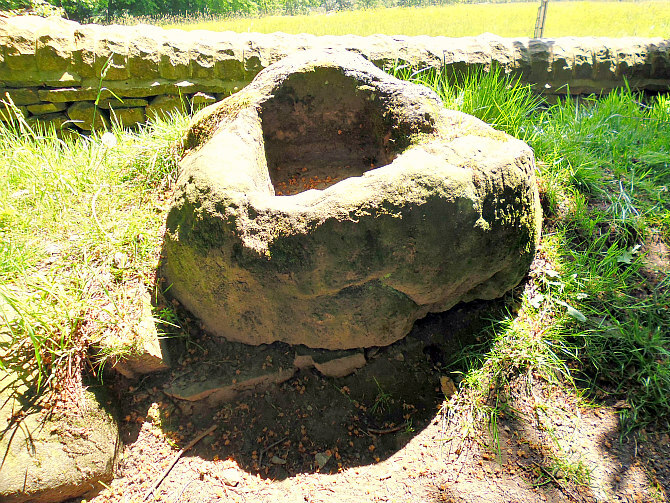 The stone can be reached from the A671 (Whalley Road) in Simonstone, then via School Lane and Trapp Lane for ¾ of a mile, passing Higher Trapp Hotel on the left. Just before the top of the lane where the woodland begins go through the wooden kissing gate – the cross-base is beside the wall. Just opposite the cross-base is the beginning of a long and overgrown woodland trench, and the track running alongside this is known locally as Shady Walks! 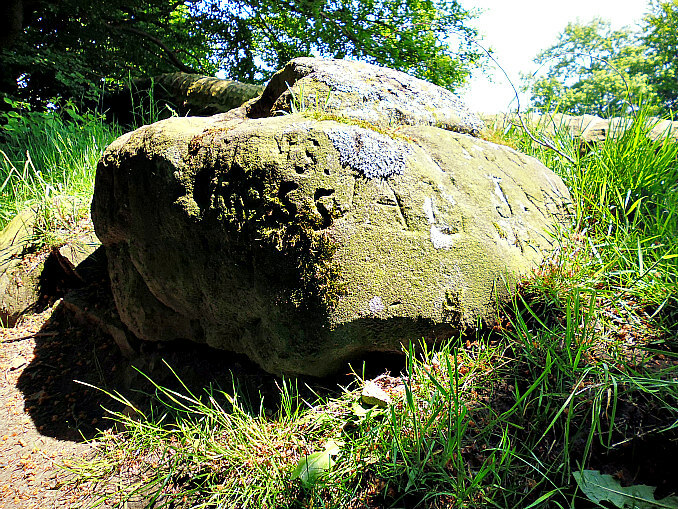 This large, natural and round-shaped boulder, known as ‘Simon’s Cross’ is roughly 4½ ft wide and just over 2 ft high and is thought to weigh 2-3 tonnes. Its socket hole is 1 ft wide and 10′ deep. But it is not always full of rain-water. When it does contain water it is locally called ‘Wart Well’ as it is said to be a cure for warts, or it used to be? When I visited there was no water in the socket hole. On the side of the boulder the words ‘SIMON’S CROSS’ are carved along with a faint cross symbol and some Latin-type letters: maybe J A M and J W and a date that looks like 1860. The cross-shaft that would have fitted into this boulder having long since disappeared, but where did it go to? Simon’s Cross (close-up of the ‘Wart Well’). Simon’s Cross originally marked the parish boundary of Simonstone and Read, and was perhaps set up in the late 13th or early 14th century by Simon de Read, or could it have been Simon de Altham in the 14th century? It could also, perhaps, be named after a member of the Whitaker family of Simonstone? But we may never know. Simonstone takes its name from any of these characters. 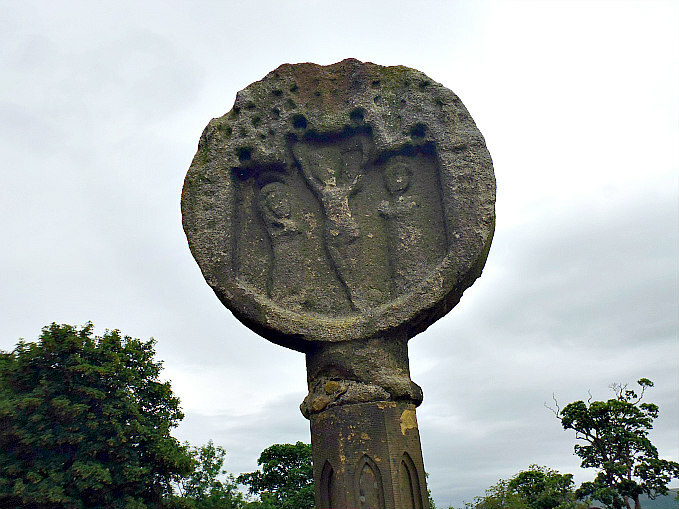 And maybe the monks of Whalley Abbey had some connection with the cross as it may have stood on land owned by that religious house, but the main landowners between here and Clitheroe were the de Lacys. 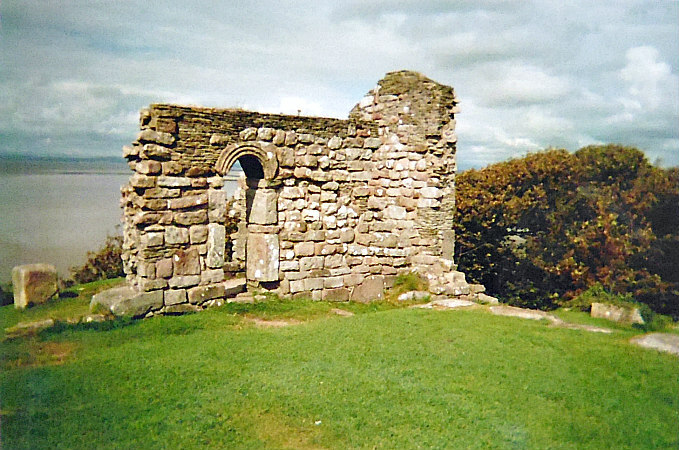 Maybe this was a wayside cross to which pilgrims on-route to the abbey could congregate at – and say prayers for a safe journey – the cross acting as a sort of waymarker. The stone for the building of Whalley Abbey is ‘said’ to have come from quarries at Read and Simonstone. “The deep, overgrown trench alongside the path in Shady Walks was a drift mine for the extraction of fire clay”, according to the 1992 book ‘Walks In Lancashire Witch Country’ by Jack Keighley. This industrial quarry working runs beside the woodland track for about ½ a mile. Clayton, John A., The Lancashire Witch Conspiracy, Barrowford Press, 2007. Keighley, Jack, Walks In Lancashire Witch Country, Cicerone, 1992. 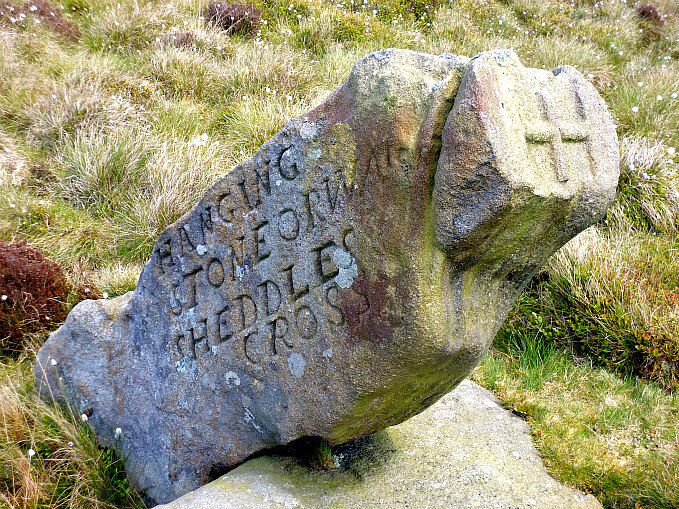 Categories: Ancient Crosses, Misc Subjects | Tags: Simon's Cross at Simonstone near Padiham in Lancashire | Permalink.